The Tupolev Tu-160M2 long-range supersonic strategic bomber will reportedly perform its maiden flight in February 2018, a Russian defense industry source told TASS news agency on November 9. “The plane with the factory number 804 based on Soviet aircraft breakthroughs will be rolled out of the final assembly workshop of the Kazan Aviation Enterprise and delivered to the flight testing station in November this year. The plane is expected to perform its debut flight from the enterprise’s aerodrome in February next year,” the source said. It “will be the first combat aircraft capable of performing the same assignments, which operational 16 Tu-160 planes do,” he added. “The 804th plane will be subsequently upgraded to the Tu-160M2 variant.” While ostensibly an improved variant of the Soviet-era Tu-160, the Tu160M2 is a new bomber in all but name, according to the Russian Aerospace Force. The Tu-160 first entered service in 1987. It remains the airborne component of Russia’s nuclear triad. While the Russian Aerospace Force operates 16 Tu-160s, about half are not airworthy and remain grounded. In 2015, Russian President Vladimir Putin ordered the upgrade of Russia’s Tu-160 force due to delays in the next-generation strategic stealth bomber project, dubbed PAK DA (an acronym for “Prospective Aviation Complex for Long-Range Aviation”). The Russian Aerospace Force intends to procure at least 50 new Tu-160M2s at a rate of three aircraft per year beginning in 2023 when serial production is scheduled to kick off. The bomber will presumably be fitted with new avionics, sensors, displays, and communications systems, as well as new operating software. Given the bomber’s limited stealth capability, it will presumably be armed with long-range standoff cruise missiles such as the Kh-101/Kh-102 (nuclear variant) air-launched cruise missile with an estimated range of 2,700 to 5,000 kilometers. The Tu-160M2 will likely carry the missiles internally on a rotary launcher. As I reported last month, the new bomber will be fitted with a more powerful engine, increasing the aircraft’s operational range and maneuverability. The Russian aircraft industry began testing a non-afterburning variant of the Kuznetsov NK-32 engine, purportedly the largest and most powerful turbofan jet engine ever fitted on a bomber, in October. “NK-32 series 2 has improved performance, and its range of flight will be increased by at least 1,000 km, compared with existing engines,” Russian Deputy Defense Minister Yuriy Borisov announced in 2015. 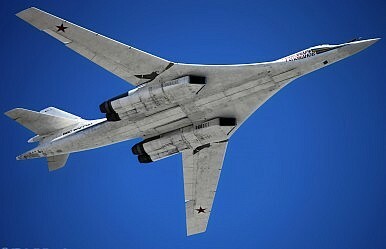 The upgrade of its strategic bomber force, including the Tu-160M2, remains a top priority for the Russian government. “We’ll continue discussing today how tasks are being solved to develop the fleet of Tu-160 and Tu-95MS strategic bombers. These planes are an important component of the country’s nuclear potential,” Russian Defense Minister Sergei Shoigu said in August.